God has blessed us abundantly and we have the opportunity to give back to God and serve others in the name of Jesus Christ. The Bible teaches us a baseline standard for giving. When we give the first fruit to the church, we put God first in our lives which creates in us a generous heart for loving God and loving others. Generosity is an act of worship that expresses our gratitude, faith, and love for others. God provides for the ministry of St. Matthew's through your generosity. This response to God’s grace and love allows us to share our faith with the next generation, support ministry locally and around the world, offer beautiful worship to God and maintain a physical presence in our neighborhood with our building. God’s work here at St. Matthew’s is financially supported by its members and friends. 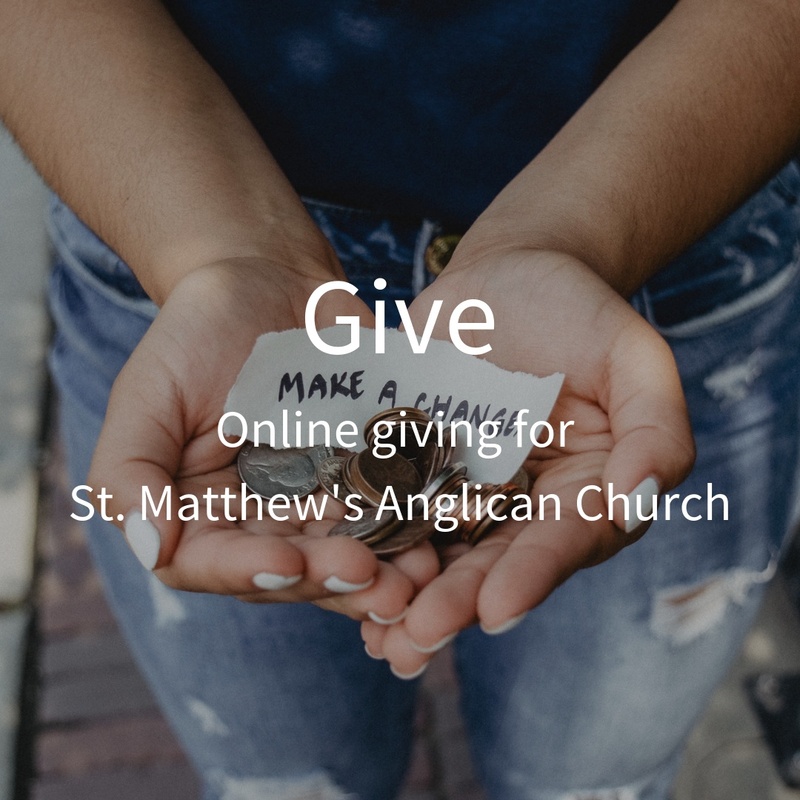 We honour your gifts with faithful stewardship, ethical business practices, and full accountability so that the financial integrity of St. Matthew's remains beyond reproach. There are many ways to financially contribute, and we are grateful for each and every financial gift. We encourage people to give through Pre-Authorized Giving (PAG). It’s the most convenient way to give with our busy lives, allows the church to effectively budget, and is kind to the environment. Through PAG, you can make automatic payments are made from either your bank account or a major credit card to support the ministry and work of St. Matthew's. You can find more details, and the enrollment form by clicking here, or by contacting the church office. If you would like help in deciding what amount to contribute, we have a Monthly Giving Chart with suggestions. Just click the link below. You may also give to St. Matthew's through PayPal by clicking the button below. You will be directed to the PayPal secure site to give. To make a gift using Canada Helps, please click here. Give as often as you wish. A tax receipt for donations of $20 or more will be sent to you. The receipt is your official receipt for income tax purposes.